Fresh Eggs Daily! It’s what’s for dinner…. Lucky for me I have a never ending supply of grocery producers and my children are always thrilled with breakfast for dinner. Really the egg is pretty fabulous. With a few basic items on hand you can whip up pretty great stuff as long as you’ve got some eggs, and with farm fresh eggs…. yum! I just try not to think too much about what the girls must think…. They have short memories really. They hardly even miss them for very long I’m sure. It’s on to the next battle for the highest perch spot this evening and they’ve forgotten all about it. 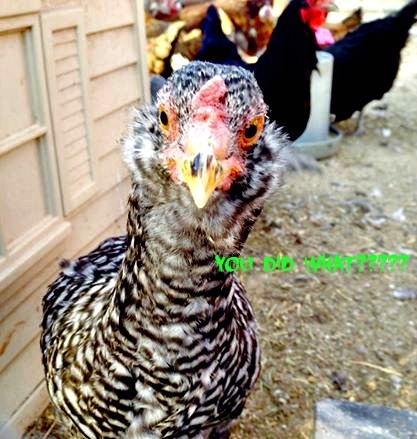 In case you’re wondering that strange hen is one of our own mixed breeds- she’s a “Barredacauna” as we’ve dubbed her- daughter of an Easter Egger hen and a Barred Rock Rooster- she gets her adorable puffy cheeks from her mother and has a hilariously curious personality which makes for good photo ops. Today was wonderfully uneventful. I’m loving these beautiful evenings of longer sunshine to do chores with the kids. They are loving the new baby goats- which definitely need a post and I’m loving that the kids are becoming more more efficient at chore work and really becoming a hand around here. There really is no better way to spend time as a family then getting your hands dirty together. ← How the day I got fired turned into Freedom.